Whiteley had arrived in Europe in 1960 determined to make an impression. Before long he was the youngest artist to have work acquired by the Tate. With his wife, Wendy, and daughter, Arkie, Whiteley then immersed himself in bohemian New York. But within two years he fled back to Sydney, having failed to break through. He soon became Australia’s most celebrated artist. He won the Archibald, Wynne and Sulman prizes in the same year—his prices soared, as did his fame. Among his friends were Francis Bacon and Patrick White, and Billy Connolly. Yet addiction was taking its toll: Whiteley struggled in vain to separate his talent from his disease, and an inglorious end approached. Ashleigh Wilson has been a journalist for almost two decades. He began his career at the Australian in Sydney before spending several years in Brisbane, covering everything from state politics to the Hollingworth crisis to indigenous affairs. Wilson then moved north to become the paper’s Darwin correspondent, a posting bookended by the Falconio murder trial and the Howard government’s intervention in remote Aboriginal communities. During that time he won a Walkley Award for reports on unethical behaviour in the Aboriginal art industry, a series that led to a Senate inquiry. He returned to Sydney in 2008 and has been the paper’s Arts Editor since 2011. 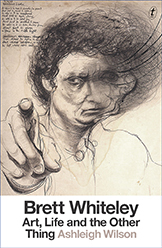 Brett Whiteley: Art, Life and the Other Thing is published by Text Publishing.